What’s the Pimsleur App? Do I need to buy it? Is my subscription good for every language, or for one language that I select? How many lessons do I have access to with my subscription? Does Pimsleur offer a free trial? Do I need to do anything to keep my subscription once my free trial is over? Will my price change during the life of my subscription? How do I manage my subscriptions if I purchased on iTunes or through the App Store? How do I manage my subscriptions if I purchased through Google Play? How do I manage my subscription if I purchased on Pimsleur.com? What if I want to change my payment method for a subscription purchased on Pimsleur.com? If I cancel, can I still access the lessons I’ve already done? When do I need to cancel by? Does my subscription end on the day that I cancel, or at the end of my billing period? What if I forget to cancel before the end of the billing period? I already own Level 1. Can I subscribe to just 4 levels? I live in Canada, how do I register for a subscription? What equipment will I need to use my Pimsleur subscription? A Pimsleur Language Program subscription offer gives you access to ALL the lessons in any single language for one low periodic charge. During your subscription you will have access to as many levels of a course as are available, for a low price that is charged monthly to your credit card. The audio courses are accessible through the Pimsleur iOS app or Pimsleur Android app. You can subscribe to Pimsleur Language Programs courses, here. You must create a Pimsleur account to subscribe. You may also subscribe through Apple or Google Play via in-app purchases through the Pimsleur Course Manager app. For more information on the iOS version of the app, go here. For more information on the Android version of the app, go here. Pimsleur’s app is free for subscribers, and is how the lessons are delivered to you. It’s a player you will need to install on your desktop or mobile devices so that you can download and manage your lessons as a subscriber. (See below for minimum system requirements.) In addition to letting you download one or many lessons, it automatically tracks your progress and syncs across devices. It gives you the ability to add bookmarks, instantly replay or go-forward in your lesson, and read along with the audio for the Reading Lessons component. Yes. 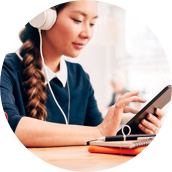 At the end of each subscription period (or your free trial, if applicable), your Pimsleur subscription will automatically be renewed and billed for another subscription period until you contact us to cancel. For details on how to cancel, see below. If you subscribed via in-app purchase, your billing relationship will be with Apple or Google as applicable and the payment method associated with your iTunes or Google Play account will be charged upon each renewal. Please keep in mind that your subscription could renew if you don’t cancel at least 24 hours before your renewal date. Please see below for instructions on how to manage a subscription purchased through Apple or Google. Each subscription is good for one language. If you want access to more than one, you’ll need to subscribe to each one separately. You’ll have access to all your subscriptions in the Pimsleur Course Manager for as long as your subscriptions are current. This varies by language, but you will have access to all the Pimsleur lessons that exist for a particular language. For most popular languages, there are 150 lessons, but we only offer subscriptions for languages that have at least 60 lessons. Pimsleur may offer a free trial. If offered, free trial lengths may vary. For example: a 7-day free trial gives you access to your language course for 7 days before your payment method is charged for the subscription. At the end of the 7th day, your payment method will be charged and the subscription term you selected will begin. No, we ask you to provide payment information when you start your free trial. Once your free trial period is over, your subscription will start automatically, and will continue until you contact us to cancel, or if you subscribed via in-app purchase, until you cancel the subscription through Apple or Google Play as applicable. No, we do not charge you for the trial period. Your subscription will begin automatically following the end of your free trial if you do not cancel during the trial period and you will be charged for your first billing period at that time. Your price may change over the life of your subscription for a couple of reasons. First, some subscriptions might have low price introductory offers. In that case, we will indicate to you at the time of purchase where an introductory price is being offered, as well as the price that will apply to renewals following the expiration of the introductory price. Additionally, Pimsleur may in the future increase the price for some or all subscriptions. For subscribers who purchased through Pimsleur.com, we will attempt to notify in advance by email so that you can choose whether to maintain your subscription and accept the price increase upon your next renewal or to cancel your subscription. For subscribers that purchased through Apple or Google Play, we will introduce and communicate any price changes in accordance with the applicable store’s policies. To manage subscriptions purchased on your iPhone, iPad, or iPod touch, go to Settings on your device, then go to iTunes & App Store and click on your Apple ID. You’ll be asked to enter your Apple ID. From there, click on Subscriptions to view, change or cancel your subscription. On your mac or PC, go to iTunes and sign in with your Apple ID or Touch ID. Click on the Account tab at the top, then select View my Account. Scroll to the Settings section, then click on the Manage link to the right of Subscriptions. Note that if you’re using Family Sharing, only your family organizer can update payment information. Detailed instructions are available here: https://support.apple.com/en-us/HT202039. For information on how to manage a subscription purchased through Google Play, please click here. To manage subscriptions purchased on Pimsleur.com, simply log in to your account at https://accounts.pimsleur.com/home. You can also contact us at (800) 578-8284, 24 hours a day, seven days a week. If you purchased your subscription from Pimsleur.com, you can cancel your subscription at any time by contacting us at (800) 578-8284, 24 hours a day, seven days a week, or by logging in to your account at https://accounts.pimsleur.com/home . If you purchased your subscription through Apple or Google Play, please see above for details on how to manage your subscription. Access to lessons is only open to active subscribers and purchasers. However, your lesson history will be saved, so if you decide to re-subscribe, your lesson history will be available. (You’ll need to re-subscribe using the same account as your original subscription to access lesson history.) Only one free trial period is allowed per subscription. If you purchase your subscription through Pimsleur.com, you must cancel your subscription not later than 11:59pm Eastern Time on the last day of your current billing period (or your free trial period, if applicable) in order to avoid bring charged for subscription renewal. If you purchase your subscription through Apple, your billing relationship will be with Apple and will subject to Apple’s policies on cancellation timing. If you purchase your subscription through Google Play, your billing relationship will be with Google and will subject to Google Play’s policies on cancellation timing. In either case, please be aware that your subscription could renew if you don’t cancel at least 24 hours before your renewal date. If you cancel your Pimsleur subscription in the middle of your subscription term, the cancellation will go into effect at the end of the then-current billing period. You will be able to continue to access your lessons until then, but we cannot issue refunds or exchanges (except, for subscriptions purchased through Pimsleur.com, in accordance with the terms of Pimsleur’s 30-day Money-Back Guarantee. If you participate in a free trial offer and cancel during your trial period, you will lose access immediately upon cancellation. What if I forget to cancel before the end of the billing period? You must cancel your subscription before it renews to avoid paying for the next subscription period. The price is the same for one level or five. Once your subscription starts, you’ll have access to all the levels of a language that exist. You only need to use the levels and lessons you wish, but the subscription fee gives you access to all of them. Many people enjoy returning to earlier lessons to work on their pronunciation or review. At the present time, Pimsleur Language Programs subscriptions are available for US customers only. If you live outside the US, you may purchase digital versions of the course on our website.